Yesterday, Tasha showed us how to enjoy a warm day, splayed out in the stream. For me, it made my day when I ran into bunch of Bear Center visitors who wanted to learn, knew some background, and asked questions. I know there are people like that there every day. I am so glad we all made the Bear Center what it is! 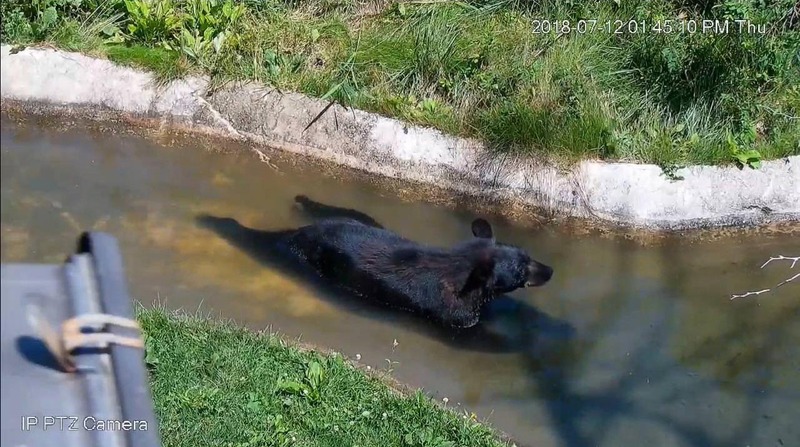 It stirs such strong interest in what black bears are really like. Eagle 7-9-18 by J. BriggsYesterday, I got a question about whether I’d ever seen bears pacing in the wild. I haven’t. And I’m glad we made the enclosure at the Bear Center what it is so bears can do their wild activities and interact together in forest habitat and cool off in the pond and stream. There is more we’d like to do in the future, if possible. In the Black Bear Field Study Course, we stopped by the eagle nest on our way pontooning to Lily and Hope’s den of 2010. It has two young eagles this year. June Briggs from the UK snapped this picture.